Buy your own pair now! The How Ya Hangin?® Boxer employs the Patented Technology to maximize the features men seek in their boxers, SECURITY, COMFORT and ACCESS. SECURITY-Don't fall out of your boxers again, CoolMax® security panel prevents boxers from gapping! COMFORT-Slip into these boxers, and experience the Comfort of the finest 100% Cotton available coupled with a breathably soft CoolMax® inner. Ample use of material ensures no binding or grabbing. ACCESS-Don't fumble for your fly, centrally located proprietary access for lefties and righties. Join the thousands of satisfied customers. Supplies are limited so order today. If you have to ask go up a size! Shipping & Handling are $4.95 per USPS Priority Mail order. NO ORDERS CAN BE PROCESSED AT THIS TIME I AM OUT OF BOXERS. Sorry, due to excessive demand, manufacturing has not been able to keep up. I am working hard to address this situation & bring new manufacturers on board. Max HYH? The challenge was to reinvent the boxer short; eliminate the traditional boxer short fly that tends to gap open and create a reengineered boxer short offering the security of a brief with the freedom of a boxer. The result is The Ultimate Boxer from How Ya Hangin®. This boxer starts with a centrally located fly. A soft rectangular panel is placed behind the fly and is sewn to the top and bottom seam. When the fly opens, the panel covers. Access to the fly is provided on the left side as well as the right. Throw out your old briefs and boxers and experience the performance of the How Ya Hangin?®. "As inventions go for underwear its probably one of the biggest things to happen to men's underwear." 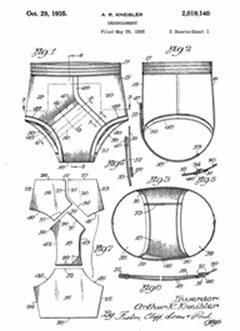 Underwear history can be followed through the US Patent library. These patents represent significant functional benefits in underwear that are unobvious, novel and have a useful purpose. The first significant advancement in underwear technology was the creation of the Jockey® Y-vent brief in 1934. This was the first time a truly functional vent was applied to boxers and briefs. This was followed closely by Munsingwear® who developed the kangaroo pouch underwear in 1936. The horizontal vent was functional and differed from the Jockey's® diagonal vent brief. This design was also used in boxers and briefs. Today, as much as things have changed they stay the same. Underwear now comes in many more colors, fabrics and patterns then at any other time. Jockey® today still continues to sell their Y-Vent underwear and also sell the Munsingwear® horizontal vent design. The functionality of underwear has remained unchanged for over 70 years untill NOW with the advent of the new How Ya Hangin'?® boxer shorts. Made in the USA. How Ya Hangin?® Is a registered Trademark of How Ya Hangin? LLC. Product protected by U.S. Patent 6,018,822. Munsingwear is a registered trademark of Munsingwear Inc. Jockey is a registered trademark of Jockey International Copyright 2010, How Ya Hangin LLC.